A hazel grows on a gully ledge, its branches mingle with those of a spindly, sparsely berried rowan and a few thorny strands of dog rose. A few metres back from this diminutive huddle of scrub is a fence with a sign declaring that native trees are being conserved; the small enclosed area is a Site of Special Scientific Interest and this lone hazel and its shrub companions are legally protected. Hazel leaves poking over the edge of the ravine. To conserve a single hazel anywhere else in the UK would seem ludicrous, but this is Shetland, where only two of this species remain (although others originating from the Scottish mainland have been planted), relicts from a time when woodlands were present and their kind was widespread. 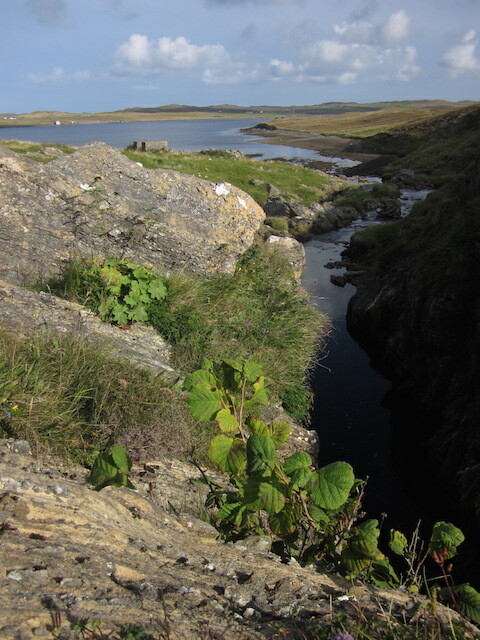 It looks vigorous enough and flowers, unlike the only other which according to the Rare Plants of Shetland ‘survives precariously at the water’s edge’ on a holm, an islet, just ‘four leafy twigs’. Fragile but safe enough from grazing unless ice bridges the water to give sheep access to the luxuriant vegetation that spills down the islet’s banks. Such was the speed of our family’s move to Shetland that I didn’t consider what it might mean to live without the quotidian comfort of trees. Our Aberdeenshire garden was more wood than lawn and included a clump of nut bearing hazels. I took them for granted but appreciated them for both their beauty and their familiarity. The woods where I grew up were full of hazel, some still worked by a coppicer who taught me how to cut a slice out of the bark on one side of a wand and to peg the wound down to the ground in the hope that it would take root and sprout new growth. I felt a pang of sadness at leaving one particular tree behind when we left our woodland garden, a venerable Scots pine. The lowest branch had been sawn off a few days earlier to release the removal lorry that had become trapped under it and for that I felt bad because the long reach of its ever-present elegant canopy had seemed to shelter one side of the small cottage from the bitter cold of Aberdeenshire winters. Ceps grew amongst the needles at the base of its deeply grooved trunk and at Christmas time we wrapped it with lights. I still miss that tree almost as I would miss a friend and I think about it often, but otherwise I didn’t give much thought to leaving the birch woods and the copse of planted rowans, branches weighed down by vast quantities of berries. I was blinkered by the excitement of living on an island, of making the leap from island-goer to island-dweller, and was caught up in all the romantic connotations that, rightly or wrongly, I thought that this would entail: a slower pace of life, nature less diluted, a good place to raise children, otters on your doorstep, to swap ice and bone penetrating cold for violent winds. At first, I was so taken with the bleak beauty of Shetland and the charismatic wildlife of these islands that I didn’t miss trees. Recently though I’ve begun to crave woods again, a feeling much heightened by encountering the gully hazel for the first time this summer. In Shetland trees have a weak presence in a landscape dominated by moor and sea, or they occur in obvious blocks of plantations. Or they are hidden away, scattered individuals or small groups – aspen, downy birch and downy willow – relicts like the hazel, left behind from a time before woodlands were cleared to make way for arable crops and pasture. The closest that Shetland now has to a woodland habitat is a series of plantations in an inland valley. I find these to be dismal places, an odd hotchpotch of tree species that even the luminous green leaves of wood sorrel can’t enchant, but my three year old son finds them exciting and so do countless other children judging by the bush craft shelters and log bridges. For migrating birds the plantations are a place of respite and, remarkably, in one parcel of wind gnarled sycamores there is a rookery which, when occupied in spring, transforms the place into at least sounding like a woodland. Shetland bumblebee on devil's bit scabious. It’s good to sit a while near the gully hazel, listening to the waterfalls, watching the deep veined hazel leaves move in the breeze, the constant movement of many bright orange Shetland bumblebees working their way round lithe stemmed devil’s-bit scabious. The water doesn’t have far to go before it reaches the sea at a place where I have watched Risso’s dolphins and otters swimming close to the shore. The sea is distraction enough from the absence of trees, but only in part. Beachcombing has become an addictive pastime, but other than cetacean bones, goose barnacles and eggcases the finds I treasure the most are the tightly coiled rolls of birch bark that have floated all the way across the Atlantic from North America. I‘ve placed the best of them in a glass display jar, tree relics more valuable to me than any bones of a saint. Slowly though the seascapes and boggy hinterlands of Shetland are seeping into me, filling the spaces left by the absence of trees. I’ve begun to notice the intricate structural beauty of sedge flowers and I’ve been captivated by a mass of cotton grass being tussled by the wind. I still miss trees but if I left now and returned to a wooded place, I think I would miss Shetland more. I am thankful though for the presence of the tenacious gully hazel, a living memorial to its kind that connects Shetland to its past. It also connects me to my past and triggers a semblance of the contentment I’ve felt in wooded places. I recently learnt that the hazel has been layered and that roots have grown so this single flowering specimen may one day help woods return to these bleak islands. In this tree I place my hope. Sally Huband has a PhD in the butterflies of Romanian hay meadows. She now lives in Shetland and writes an online nature diary, Rain Geese and Selkies, for BBC Wildlife Magazine. All photos by Sally Huband.